Generally the relation of prices is below. A shogi pieces "Moriage-koma" made of native boxwood, which is same color and same pattern, is over 1,000,000 yen !! Generally speaking, there is a relationship between the price and the shogi piece. How to finish The color and pattern of pieces a little differ from each other. The color and pattern of pieces have gathered. A special shogi piece which is made of Hon-Tsuge and the color and pattern of pieces have gathered, the price is over 1 million yen. It is for high grade shogi pieces. We can get it at Mikurahjima in Tokyo Metropolis and Kagoshima Prefecture. It is for medium grade pieces. It means boxwood in other countries. We can get it in Thailand and Cambodia. It is for popular and medium grade pieces. We can get it at Tohoku area in Japan, around Yamagata Prefecture. A Oshi-koma is stamped pieces. They started to make oshi goma in about 1930. They directly stamped the lettes to base wood. Larger picture ...(24KB) A Kaki koma is painted pieces. They directly painted the letters to base wood by japan (Japanese lacquer). There are 2 types of fonts, Kaisho and Sousho. The kaisho is print and the sousho is running hand (script). The "Tendo koma" (traditional shogi pieces in Tendo) is a Kaki-koma painted Sousho. They call a Kaki-koma painted Sousho "Bantarou goma". It is named after in Edo era (17C). There were many kidoban (police station?) in Edo town and they called keepers bantarou. Bantarou often played shogi, they called it bansho sougi and their cheep shogi pieces Bantarou goma or Banta goma. There are some kinds of Kaki koma in a difference of japan color. They paint black character on the head and red character on the tail. 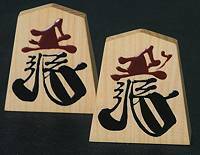 The top of shogi pieces is painted red characers and the bottom is black on the head, red character on the tail. They paint red character on both head and tail. A Hori-koma is carved pieces. There are 2 major types of Hori-koma, Kikaibori (made by machine) and Tebori (made by hand). And there are 4 types by degrees of simplicity of charaters, Kurobori (simplest character), Namibori, Cyubori and Joubori (truest character). Especially the Hori-koma carved special fonts (ex. Minase font, Kinki font) is called Mei-goma. This is a kind of Hori-koma and carved only one character (ex. Ou and Oushou). A Horiume-koma is a higher grade shogi piece, painted shogi pieces flat by japan on the carved pieces. At first they make hori goma (carved pieces). And next they painted characters on the carved. At last they sand down pieces flat. Larger picture ...(18KB) A moriage goma is a highest grade shogi piece. They paint characters on the horiume goma by a makie hude (special brush), the character is swelled. It is very expensiv, it is used at the professional shogi games. makie fude : it is a special brush made of rat hair or cat hair. The thickness is from 1 sun (about 3 centimeters). Index of "Shogi pieces in Tendo"